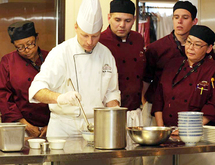 Auguste Escoffier School of Culinary Arts in Austin, Texas is nationally accredited by the Council on Occupational Education (COE) and approved and regulated by the Texas Workforce Commission-Career Schools and Colleges. Auguste Escoffier School of Culinary Arts in Boulder, Colorado is nationally accredited by the Accrediting Council for Continuing Education and Training (ACCET) and approved and regulated by the Colorado Department of Higher Education, Division of Private Occupational Schools. Clicking the "Request Information" button below constitutes your express written consent to be called and/or texted by Auguste Escoffier School of Culinary Arts at the number(s) you provided, regarding furthering your education. You understand that these calls may be generated using an automated technology.